The Hubtel USSD platform is designed to connect your USSD Applications to designated codes on all networks. This allows you to continually reach and engage more customers with your service offerings. To further make this experience an even better one, we recently migrated accounts from the old systems to a new USSD Core system. Here, you'll find the most frequently asked questions regarding this system migration. 1. Why the need for this migration? The migration is needed to improve the availability and response times of the USSD System. 2. How long will the planned migration last? The migration will take place on 12th September, 2018 from 10:00pm to 12:00am. 3. Will the USSD service be affected during the migration period? Yes. The service will experience some down times during the migration period. No. The new USSD System had been designed and engineered to accept all previous requests and applications which previously worked on the old system. This means there is no need for any development work to go into connecting to the system. 5. Do I have to request for a new USSD code different from my current one? Your current USSD code and mapped applications will all be migrated to the new system. Once your code is active and working you will have access to it. There is no need to request for a new code for the same application. 6. What will happen to my current test codes? All test codes will not be migrated to the new system. 7. What will happen to previously approved but inactive codes? Codes which have been approved on the current system but have not yet been activated because of non-payment will not be migrated to the new system. 8. Will the current process of requesting for a USSD code change? The current process will change. Payment will have to be made for newly requested codes before they are approved. Once this approval is done, you will receive notification to begin using your code. 9. What is a USSD session? A USSD session is a two-way connection created between your customer and your USSD application. If a customer uses your service three different times, then he/she has used 3 sessions. 10. 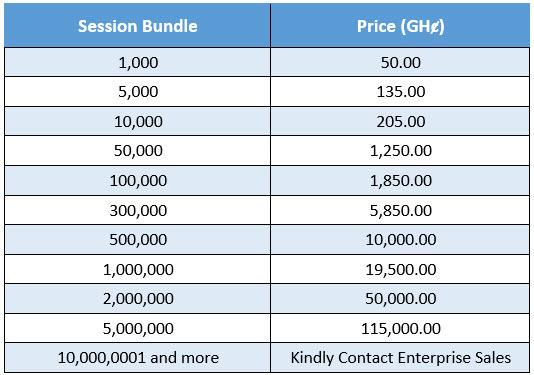 What are the new USSD session bundles all about? Session bundles are a unique quota of sessions allocated to your account. These bundles can be purchased and used for your codes at anytime. 11. How long will session bundles last? Session bundles do not have an expiry date. They will keep on being active till they are either exhausted or your USSD code rental period has ended. Session quotas currently assigned to accounts on the old system will continue to function as before on the new system. They will be converted into bundles and allocated to accounts as before. The count will not change. 13. What are the rental fees for shared and dedicated USSD codes? 14. For what duration of time can i rent a ussd code? USSD codes will now be rented on a quarterly basis (3 months). This means, you will no more be able to rent codes for 1 month. They can only be rented for durations of 1, 2, 3 or 4 quarters. 15. Will I be allocated a specific bundle when i rent a ussd code? Yes you will. All Shared codes which are newly acquired will be allocated a bundle of 300 sessions and all newly acquired dedicated codes will be allocated a bundle of 300,000 sessions. Kindly note that this also applies to code renewals. 16. What are the available bundles i can purchase for a shared code? 17. What are the available bundles i can purchase for a dedicated code? 18. What steps do i need to follow in order to purchase a session bundle? a. 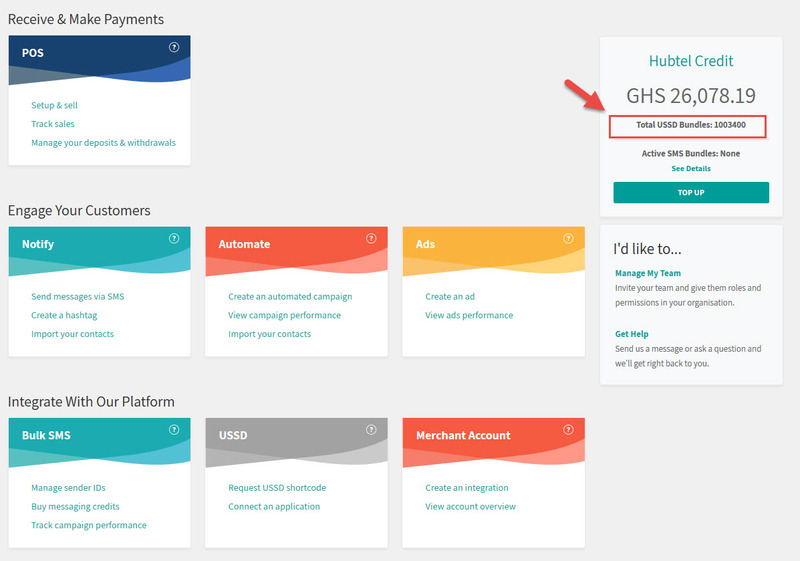 To purchase a bundle, login to the Hubtel unity portal. c. Select the Choose a USSD Bundle option on the lower right side of the page. d. Select your desired bundle. f. Review your purchase and click on Confirm And Proceed. 19. When i dial my USSD code, i see an error on the screen. What does it mean? 20. How can I know my current session bundle balance? You can view your remaining USSD session bundle on the Unity homepage. Right underneath your Hubtel credit balance.